GAVIN REILLY has completed his move from Queen of the South to Hearts and signed a three-year contract. 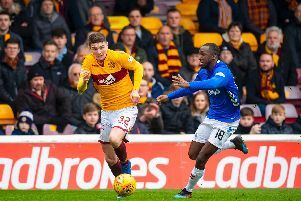 A compensation package has been paid to Queens for the 22-year-old striker, who had already agreed terms with the Edinburgh club. Head coach Robbie Neilson could have another forward in place soon as the Spaniard Juanma prepares to fly to Scotland. The Evening News revealed last week that Hearts were trying to negotiate his release from the Greek club Kalloni. Tynecastle officials have been told he is now a free agent but will seek official documents to confirm that before offering him a contract. Provided all is well, the 24-year-old could sign for Hearts later this week. Reilly put pen to paper this morning on a three-year deal and will join his new team-mates for pre-season training tomorrow. A loan move to Queen of the South for Hearts striker Gary Oliver had been discussed as part of the deal, but instead Queens have accepted a cash payment to cover the development fee they are due for Reilly. Neilson told the club website that he expects Reilly to develop into a top striker at Tynecastle: “I’m delighted to get Gavin on board here at Hearts. He scored 15 goals last season in the Championship and now he’s stepping up into the Ladbrokes Premiership with Hearts and I’ve no doubts that he can develop into an excellent player. “He’s a hard worker, a good finisher and he makes runs over the top which will allow us to press really high up the pitch as well. He’s desperate to come through here and he’s desperate to do well for us. You want players who have got that hunger and, from having spoken to him a couple of times, you can tell he’s desperate to progress his career and he sees Hearts as a good opportunity for himself. Neilson had targeted Reilly several months ago and made his move at the end of the season. The clubs took several weeks to agree on a deal but, with all parties now happy, Reilly can begin the next chapter in his career. He scored 15 goals in 39 games for Queen of the South in last season’s Championship, and managed 12 in 40 games the previous season. Hearts see him as a versatile forward, who can operate as a central striker or in a variety of attacking midfield roles. Reilly will compete with Osman Sow, Soufian El Hassnaoui and Dale Carrick for striking berths in the Hearts side. Oliver is likely to head on loan elswhere to play more regularly, and the arrival of Juanma would complete Neilson’s new-look attack.